WASHINGTON, DC, and ATHENS, GREECE, October 23, 2017 /24-7PressRelease/ -- Distinguished Leaders from across the globe were recognized at the 21st Global Goddess Artemis Award Ceremony held at the Acropolis Museum in Athens, Greece. The program was under the auspice of and hosted by the Honorable Elena Kountoura, Minister of Tourism of the Hellenic Republic. Distinguished leaders in business, academia, philanthropy, and the arts from across the globe were in attendance. The 21st Annual Global Goddess Artemis Award Honorees and Distinguished Host, the Honorable Elena Kountoura, Minister of Tourism of the Hellenic Republic stated, "On this occasion I would like, first of all, to applaud Loula Loi Alafoyiannis and all of the EAWC's spectacular work and commitment for more than two decades in the field of strengthening the status of women in leadership positions. Women's contribution is invaluable in the global efforts for strategic alliances that advance innovative change, economic growth and social prosperity, aiming to create a better future for the next generations. This program held in Greece provides a unique opportunity for prominent leaders and prestigious personalities to interconnect and exchange thoughts and ideas on how to move forward on a national and international level. It also marks an open invitation for all participants, to become partakers of the Greek Spirit and culture, as well as ambassadors of the great values of Hellenism and our amazing Country. " 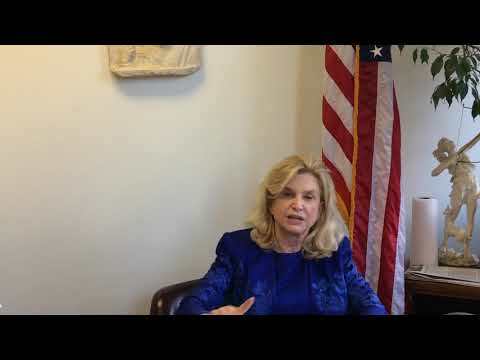 Editor-in-Chief of the medical and scientific website "onMed"
In a video address shown at the Global Goddess Awards Ceremony, The Honorable U. S. Congresswoman Carolyn Maloney stated to the audience, "I congratulate all of the Honorees of this prestigious award, I also congratulate the Founder, CEO and President of EAWC, Loula Loi Alafoyiannis." The Congresswoman is founder and co-chair of the Hellenic Caucus, which is one of the largest caucuses in the U.S. Congress. She touched on the subject during her speech, "The goal (of the Caucus) is to increase the friendship and cooperation of these two great countries," she said. "A major item on the agenda is the return of the Pantheon Marbles back to Greece and as such I have put in Bill HR51. The Pantheon Marbles were created by Greece, created for Greece, and they belong in Greece." She stated. Loula Loi Alafoyiannis, Euro-American Women's Council, and Founder & Executive Global President, and the organizer of the prestigious 21st Annual Global Artemis Award ceremony, addressed the packed audience at the Acropolis museum. Loula also gave a special thank you to the members of the EAWC Board, including Judy Sheppard and Edie Fraser for their long time support and commitment. Loula highlighted her appreciation to the Mayor of Athens, The Honorable George Kaminis, the Mayor of Amaroussion City and President Central Union of Municipalities of Greece, The Honorable George Patoulis, Mistress of Ceremonies for the 21st Global Goddess Artemis Awards: Emi Livaniou. She also recognized Konstantinos Mastorakis,CEO Know-How, Director Communications Nazzionale Pilote Formula 1, Mr. Thomas Kong, President US-China Cultural Exchange & Development Association, Stamatia Trivoulides, Artist and Board Member of the Women's Museum in Washington DC, Exsekias Trivoulides, artist and sculptor, creator of the Bouboulina award 2017, Television Host and Producer and Co-Founder of startup Doobbear Asimina Tzatha and Producer and Founder of startup Doobbear Konstantinos Gkavelas. George Patoulis, President of Central Union of Municipalities of Greece, Mayor of Amaroussion, President of the Medical Association of Athens, founder of "IATREIO KOINONIKHS APOSTOLIS"
Kostas Mastorakis, Owner of EWW Consulting, P.R. Director at "NATIONALLI PILOTTI F1"
EAWC would like to thank all of its coalition partners, supporters and media partners. The biographies of the Honorees, a media wall with video and photos from the program, and all supporters' acknowledgement may be found at www.eawc.org. Dr. Terry Neese, founder and CEO of the Institute for Economic Empowerment of Women, entrepreneur, public policy strategist, women's equality advocate, and award-winning small business owner. Dr. Neese, resides in Oklahoma, has created several non-profit organizations and businesses, she has spent time in Afghanistan mentoring the women there and advocating for their right to equality. Dr. Neese was recognized for her commitment to increasing women's roles in business ownership and shaping public policy. The dynamic and tireless Loula Loi Alafoyiannis founded EAWC twenty-one years ago. The mission of EAWC is to strengthen the status of women in the global marketplace by building strategies and alliances between women in business and prominent leaders across the United States, Europe, Mexico, Latin America, Asia and many places all over the world. Through EAWC, women of diverse backgrounds and various accomplishments work together to advance women's access to positions of leadership and responsibility. EAWC is helping to pave the way for the further generations of business leaders.